Stems: thick,.fleshy, one to two feet high. Leaves: lanceolate, obtuse. Flowers: spike long, white, very fragrant, bracted; sepals ovate, obtuse; lip entire, dilated; anther-sacs parallel; glands close together; stigma with a trowel-shaped beak. To walk through the woods, deep and dark, where the trees and shrubs grow densely side by side and flowers are few and far between; and then to suddenly emerge into the open, where the sun's light is flooding across the marshlands, carpeted by myriads of tall White Rein Orchis, is a pleasure so dazzling that, once experienced, it will never be forgotten. Fragrant as hyacinths, these exquisite snowy orchids grow to a great height in the mountain marshes, and so beautiful and wonderfully delicate are their blossoms that travellers long to transplant them to some lowland garden, in order to see their velvety spikes grow and grace civilization with a woodland loveliness. But as a rule this experiment is tried in vain, for few of the orchids will flourish so far from their native soil. Words fail to truly describe these plants of almost unearthly beauty. From their dainty petals" Odours ascend, Spreading themselves through the serener air Where gentle breezes strive to bless, And all God's world knows happiness." Those who find them will always love and treasure them. Habenaria bractcata, or Long-bracted Rein Orchis, is one of the conspicuous green orchids which grow in great profusion in the mountain regions. It has a stout juicy stem, broad leaves, and many long pointed bracts on its flower-spike. 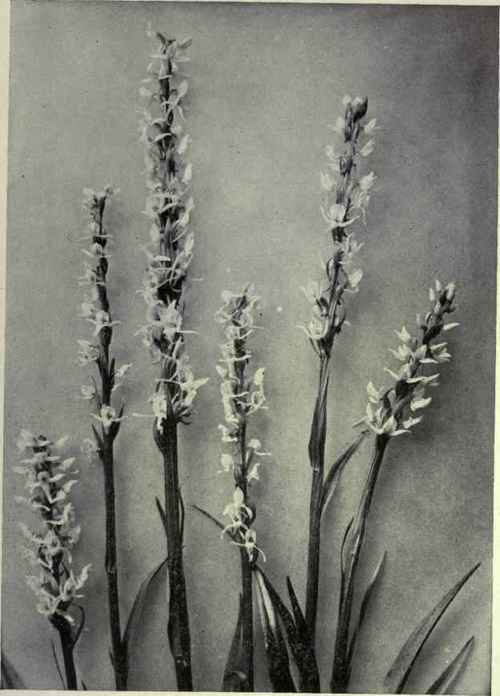 Usually found in wet places, this Orchis may always be distinguished by the long bracts, from which it derives its name.